Cade Courtley, a former Navy SEAL, has trained for years on how to survive dire situations and used many of the lessons he learned in the military to help develop his how-to guide called, "SEAL Survival Guide: A Navy SEAL's Secrets to Surviving Any Disaster." According to Arbitron, the average American spends 15 hours a week in the car – that's roughly five years of your life spent behind the wheel. 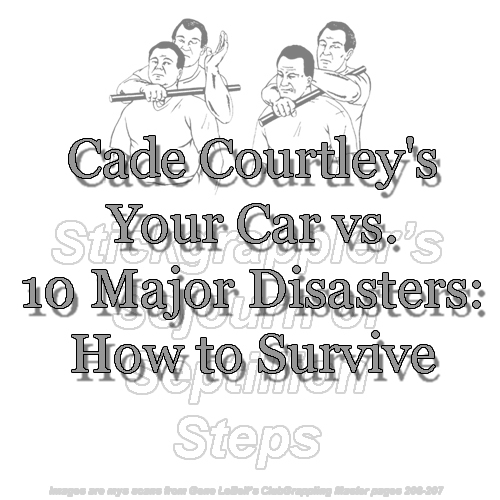 In his interview with "20/20" and in his book, Courtley described the various disasters you can encounter while in your car, and how to survive them. If your car is caught in an avalanche, Courtley said the first thing to do is turning on the overhead dome light, because it can help calm you down, and turn the engine off. "You're going die from carbon monoxide a lot faster than you will from suffocation," he said. Then Courtley suggested bringing legs to your chest to keep warm -- your body heat will keep car warm for a while and snow acts as an insulator. Don't open doors or windows, he said, because "snow is like cement. You won't be able to push past it, but it will flow into your car and fill it up." Courtley said your car will act as an air pocket for a couple of hours, so it is important to breathe slowly and evenly to make your supply last. Don't light a fire, even a cigarette, inside the car because you will be using up precious oxygen, he added. You should also honk your horn repeatedly to get people's attention. A car is not the safest place in a tornado, Courtley said, who suggested getting out of the vehicle and either taking shelter in a completely covered structure or laying down in the nearest ditch. You can also try to get out of its path by driving 90 degrees to the right or 90 degrees to the left, he said. The goal is to have the tornado in your rearview mirror. If there is no time to get out of your car, Courtley suggested staying buckled in and lay as low as possible inside, below the windows, to protect yourself from flying debris and broken glass. It's important not be a "sitting duck," stuck in traffic when the storm hits, Courtley said. Have alternative evacuation routes. He suggests driving away from the storm as quickly as possible, but not so fast that it would cause the car to hydroplane. Courtley also cautioned against driving through water – "If you can't see the pavement, then the water it too deep, don't drive through it," he said. It only takes 18 inches of water to lift your vehicle off the road, Courtley said, so avoid low-lying water. If you have an opportunity to get out of the car, Courtley said roll down the windows and have an escape route planned before you exit the vehicle. But if you find yourself trapped inside your car during a flash flood or a mudslide, Courtley suggested staying in your vehicle. "The car protects you from floating objects or being dragged by the water," he said. If your car is plunging towards water, Courtley said the first thing to do is brace for impact by leaning back, scrunching your shoulders so your neck is between them, straighten your legs out and fill your lungs with air. The other important thing to remember, Courtley said, is to stay calm. You have roughly two minutes before your vehicle will fully submerge, he said, "if you panic, you will lose your oxygen." As soon as you can, roll down the windows and unbuckle your seatbelt – Courtley said the engine will stall, but you should be able to turn the car battery on to lower the windows. If not, he suggested breaking the windows to escape the sinking vehicle. "Keep a window breaker device Velcro-ed to door for easy access or find a heavy object like a flashlight to break a side window," he said. "It breaks more easily if you hit an edge or corner. Front windshield is hard to break." As a last resort, Courtley said to open the door and make sure the doors are unlocked. "You won't be able to open doors until the water pressure has equalized inside and outside," meaning the water has to almost fill the car, he said. If you come across a downed power line while driving, a common occurrence in a storm, Courtley said to stay in your car. "You've got four tires, rubber. That is acting as insulation. That's keeping you within this car from getting electrocuted," he said. If you have to leave the car because of a fire or a life-threatening injury, Courtley said to use extreme caution and don't let anyone touch the car because it can electrocute them. He suggested placing a rubber floor mat outside of the car as far as would be reasonable for you to jump to: "Most floor mats are made of rubber. That's going to help act as the insulator, just like the tires." Leap far and away from the car, so that no part of your body or clothing touches the vehicle and the ground at the same time. Then Courtley said to "shuffle away" from the car by keeping both feet close together. This can minimize the path of electric current and avoid electric shock, Courtley said. Another option, he suggested, is have another car come and push your car out of harm's way. In an earthquake, Courtley you should stay away from large trees and buildings. If you happen to be in a large, multi-level parking garage, Courtley said get out of your car and lay down next to the tires. The space between two cars is the safest in an earthquake, he said. It's important to avoid being a target in the first place, Courtley said. When you're stopped, be on your cell phone or eating food, and don't ride with the windows down and the doors unlocked. He suggests checking your rearview mirror to watch for people who might be creeping up on you. Never park next to a van, Courtley added, especially next to one with a sliding side door, and don't let your car be boxed in. Leave plenty of room to drive off and maneuver around other cars. One tactic carjackers might use is called "bump and jump." Courtley said if someone bumps your car and you feel vulnerable, don't get out of the car. If you find yourself being carjacked and you are forced to drive, Courtley suggested driving to a police station or a crowded place. Tell the carjacker there are children in the car with you, Courtley suggested, because they likely won't want the extra trouble. Also say that the car has a tracking device that can't be deactivated. Courtley also suggests driving erratically, including drifting into other lanes, slamming into mailboxes, leaving the turn signal on, tapping the brake lights to make flashes, driving with your high beams on or your headlines off if it's dark outside, anything to attract attention to your vehicle that something might be wrong, and hopefully a police officer will pull you over. If you are carjacked and the suspect locks you in the truck, Courtley said there are a few things you can do to escape. In some cars, you can disconnect the rear brake lights and kick them out to alert cars behind you that you are in the trunk. Many trunks have escape cords now, Courtley said, and you should know where in your car that is located. You could also try sneaking into the backseat by forcing the seat down and then escaping out of the back door. If the car stops and the suspect goes to open the trunk, Courtley suggested having your tire jack hardware ready to attack. Cade Courtley's "10 Ways to Think and Act Like a SEAL - And Survive"